As Norton delivering best security reformations in online threat protection, its new version Norton Internet Security 2013 continues to provide consistent security against all dangerous threats available on internet. 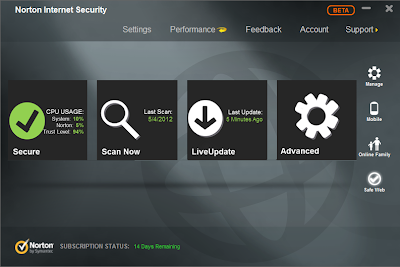 Norton Internet Security 2013 offers the accurate blocking mechanism for cyber-attacks with its powerful cloud technology while you are browsing, shopping or socializing. The latest version now has support for Windows 8 and it has been designed to look like Metro UI style. You can get 30 days trial version, but 1 month will not be enough to completely protect your PC or assess the Norton product. So, as a promotional offer a 90-day free trial Norton Internet Security 2013 and activated product key will be given absolutely at no cost. Read NIS 2013 complete review and download using direct link given at the end. As you run the application installer, Symantec’s wants to participate with Quorum – Norton’s behavior-based detection engine, but it totally optional and will not affect the remaining setup if you skip it. If you would like to enjoy the 90 days trial period, you must register with Norton and there is no way out of it. The registration will be done in the installation process itself without jumping to company’s official website. Enter few details like Email Address, Name, etc and that’s it. Overall, the Installation is simple and of course you don’t require a reboot to complete the course of activation. NIS 2013 has a big improvement in its interface i.e. its optimization for Windows 8 and touch screen computers. A set of options are available on right-side for managing the account, getting mobile app, accessing Online Family feature and many more. Four important sections are displayed as big square boxes for four different functions. “Secure” – for exhibiting security status, CPU Usage and other performance levels. “Scan Now” – to scan full PC, selected drives or removable devices and to show the last scan status. “Live Update” – to display the last updated virus database and finally “Advanced” module to customize protection levels and deep settings. The features will be mostly similar to Norton Antivirus 2013 version, but there are some unique functions which will distinguish from other Norton products. Let’s look at those. 5-layer Protection – The Norton Protection System has five different layers to unearth and remove threats more quickly than ever. Download Insight 2.0 – Stops dangerous applications from installing which makes PC unstable or inaccessible. Norton Safe Web – Protects your online activity like blocking unsafe websites, deleting malicious downloads, scanning links shared through Facebook, etc. Browser Protection – Checks for internet threats as soon as your default web browser loads, and removes them before they get infected. SONAR Behavioral Protection and 24x7 Live Threat Monitoring. 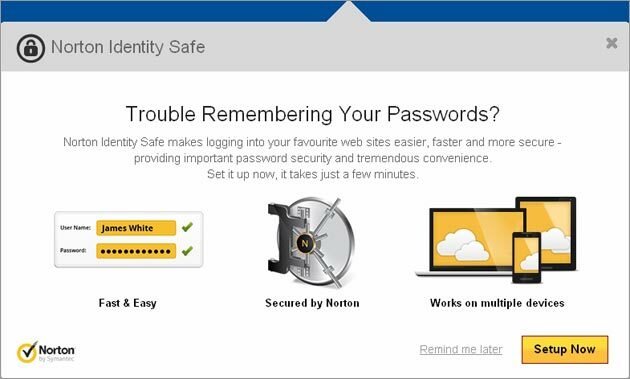 Norton Identity Safe – It securely memorizes your sensitive information entered via browser like usernames and passwords. Anti-phishing – Stops deceitful “phishing” websites which steal your private information and identity and use it for other illegal purposes.